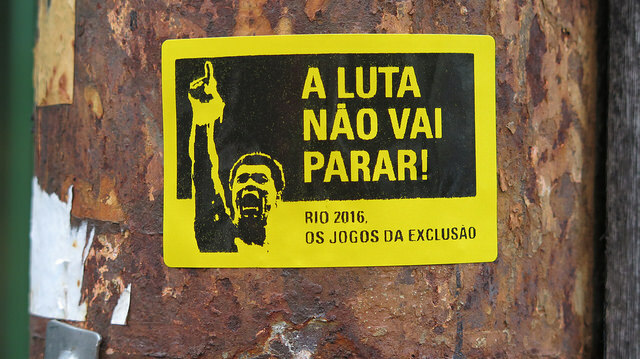 “The Exclusion Games” protest prior to Rio 2016 Olympics Opening Ceremony. Image by Catalytic Communities via Flickr. In Rio de Janeiro—the “marvelous city”—there is an old port where slave ships that brought captive workers from different parts of Africa to the center of the colony docked. The port area has been recently named (not that creatively) the “Marvelous Port” (Porto Maravilha) after a reconversion process that is paradigmatic of a broader gamut of urban interventions designed to prepare the city for hosting sports’ mega-events, such as the Pan American Games (2007), the World Cup (2014), and the Olympics (2016). Formally referred to as a beneficiary of the Olympics legacy, Porto Maravilha is the result of the biggest public-private partnership (PPP) in the country. It covers a total area of five million square meters, including the city’s docks, the old slave market, its first favela, some samba school warehouses, and the famous Praça Mauá, which now houses the Santiago Calatrava–designed Museum of Tomorrow (Watts and Douglas 2016). This so-called partnership has opened up a new market in urban development in Brazil. Contractors have taken control of running services traditionally provided by the municipality, such as garbage collection, public lighting maintenance, and traffic management. In the next 15 years, it is estimated that the city will transfer U$ 2.3 billion to the private sector for these services alone. This type of state operation is both decisive and subordinate, as it co-produces a privatized neighborhood to be put under the complete control of capital. If today’s global sporting events, a “society on steroids” in the words of one critic (Graham 2012), illustrate broad social trends, particularly the “new military urbanism,” then the Rio Olympics are the closest we get to a materialized, neoliberal dystopia. The production of a maximum-security urban enclave for the sanitized carnival of consumption and entertainment of global elites in one of the world’s most beautiful and unequal cities is a unique corporate, military, and mass media spectacle, requiring massive doses of state violence, urban intervention, and exceptional legal measures. In an authentic war-like operation, the security apparatus of the Games involved soldiers, helicopters, naval vessels, and some 85,000 personnel, doubling the number of security officials in place during the London Games in 2012. Defying the classical legal separation between police and military functions, 20,000 soldiers were on the streets of Rio during the event, with 18,000 personnel also based in São Paulo, Manaus, Salvador, Brasilia, and Belo Horizonte to cover football matches. The Brazilian state stockpiled 18,000 rubber bullets, 4,500 stun grenades, 4,500 tear gas grenades, 900 pepper sprays, and 900 ginger sprays to be used by security forces during the Olympic Games. If preparing for the Olympics is tantamount to waging war, in Rio it was a very specific war against the poor. It is estimated that, in the name of the Games, 77,000 favela residents were evicted and many more forced to leave through gentrification. Several community sporting facilities were shut down around the city and replaced with elite facilities from which local people were excluded. According to Amnesty International, by the month prior to the opening ceremony, more than 2,500 people had been killed by the police since 2009, when Rio de Janeiro won its bid to host the Games. The communities most affected by this violence by the security forces are those located around the main access routes to and from the international airport and competition arenas. A decisive component of this warfare business has been the so-called UPPs (pacifying police units), a highly selective security policy designed to “pacify” through military incursions urban territories long controlled by drug gangs. Geographically concentrated in some of Rio’s most notorious favelas, the UPPs are “an integral part of Rio’s entrepreneurial city strategy centered around the 2014 World Cup and the 2016 Olympics” (Freeman 2012, 95). They facilitated a set of neoliberal accumulation strategies at four levels: (1) the marketing of the games; (2) the business of building and preparing the mega-event city; (3) real estate valorization; and (4) the production of the favelas themselves as commodities and markets for commodities (Freeman 2012, 106 ff.). Complementary to the UPPs, since 2009 the municipal government has run a program called Choque de Ordem (shock of order), a zero-tolerance program that targets minor infractions in the wealthy zones of Rio de Janeiro: irregular parking, street vending, non-permitted construction, minor drug offenses, sleeping on the street, and public urination (Gaffney 2016, 234). Taken together, the forced removal of sections of the poor from their neighborhoods, the military occupation of certain favelas near the wealthy regions of the city, the privatization and cleansing of entire neighborhoods, the military enforcing of behavior in urban areas, and the adoption of exceptional legal measures are practices that lie at the heart of neoliberal strategies of accumulation: war-like social control programs linked to the expansion of business interests. They represent “tactics of shock and awe to stage the city as a laboratory for various forms of neo-liberal bio-politics” (Gaffney 2016, 234); they also constitute a case of what David Harvey calls “accumulation by dispossession,” through which the state engineers the military conquest and control of territories and the capture of assets by force in order to create outlets for the expansion of private capital (Freeman 2012, 95). In Foucauldian terms, these dynamics express the coexistence of different power technologies through which the sovereign control of territories, the disciplinary gaze, and the risk-based government of populations articulate the production of neoliberal governmentality. During the Olympics, a cruise ship, the Silver Cloud, docked in Porto Maravilha. In it the golden US basketball dream teams hoped to be better protected against some of the major risks that lurk in the marvelous city, such as crime, terrorism, zika virus, and other pollutants. The area close to the liner was guarded round the clock by 250 policemen. Two boats of the Federal Police patrolled the waters around the pier to prevent navigation in the vicinity of the luxury liner. Transportation during the events was conducted through special lanes across the city, guaranteeing the isolation of the participants. Both in its literal materiality and metaphorical power, the cruise ship as urban space represents the segregationist logic and state-supported logistics inherent in organizing a spectacular public event for private profit. * Laurindo Dias Minhoto (lminhoto@gmail.com) teaches legal sociology and sociology of punishment at the University of São Paulo. He is a former visiting scholar at the Center for the Study of Law and Society, UC Berkeley (Fall 2015).